“’Decoding Chomsky’ reads like a detective novel. So many of the arguments I found right on the mark, but I would recommend it just for the pleasure of reading Knight’s great English prose, particularly his talent for understatement. A truly fantastic work, simply brilliant. I could not put it down. — Luc Steels, Institute for Evolutionary Biology, Barcelona. — Frederick Newmeyer, author of The Politics of Linguistics. — Michael Tomasello, author of A Natural History of Human Thinking. — Daniel L. Everett, author of Language: The Cultural Tool. — Tom Bartlett, The Chronicle of Higher Education. — David Golumbia, author of The Cultural Logic of Computation. — Marek Kohn, author of As We Know It: Coming to Terms with an Evolved Mind. — Gary Lupyan, Professor of Psychology and Cognitive Science, University of Wisconsin. — Bob Feldman, Students for a Democratic Society Steering Committee (Columbia University) 1968. — Bruce Nevin, The Brooklyn Rail. — Michael Johnson, Overweening Generalist blog. the Science and Revolution website. Author ckPosted on 23/09/2007 13/10/2007 Categories Activism, On Noam ChomskyLeave a comment on Noam Chomsky: Politics or Science? Chris Knight of the Radical Anthropology Group concludes his examination of a political enigma. 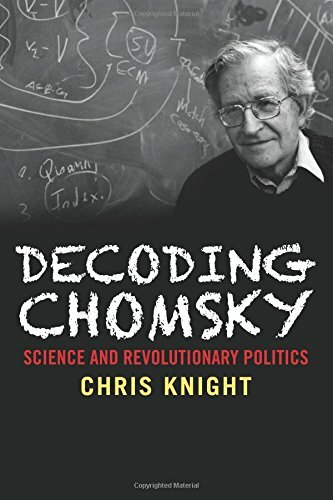 Chris Knight of the Radical Anthropology Group continues his examination of the Chomsky enigma. How is that a powerful critic of US imperialism has been regarded as a valued asset by the US military? In the first of three articles Chris Knight of the Radical Anthropology Group begins his examination of the life and work of Noam Chomsky.